Petticoats and Pants, this Norman Rockwell painting, appeared on the cover of Judge published June 1, 1918. An alternate title for this painting is Man Wearing Kilt, Woman Wearing Suit. This was the fifth cover by Rockwell to appear on Judge and the third of four in 1918. 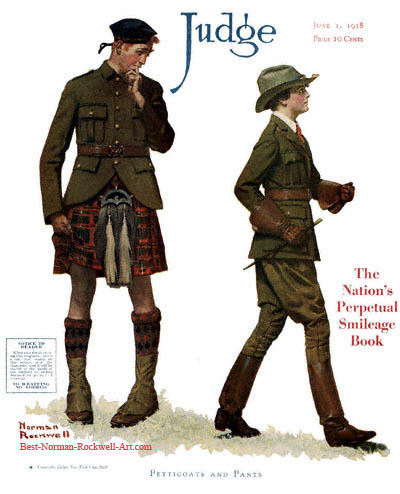 Judge only published six Rockwell covers, from 1917 to 1918. Rockwell only submitted to this smaller magazine after the publishers of the larger magazines had declined to publish the cover illustration. This gentleman appears to have lost his pants. Of course, he is wearing his dress kilt. His socks match his kilt. His spats match his jacket. The item hanging around his waist, his sporran, seems to match the color of his beret. Since kilts do not have pockets, the sporran serves as his wallet. He can also carry other items in his sporran, dependent on its size. The lady seems to have lost her skirt. Of course, she is dressed for horseback riding. She wears riding boots and gloves. She carries a crop in one hand. The gentleman looks amazedly at the lady. We can only speculate why the man looks this way. Is he jealous of her attire? Is he concerned about the riding crop? Is he gazing longingly at her leather boots? Judge magazine billed itself as "The Nation's Perpetual Smileage Book." It was a natural fit to feature Rockwell's humorous paintings on the cover. Credit goes to Geoffrey Pruitt for telling me that the item around the man's waist is called a sporran. Thanks, Geoffrey .